This is a collection of cooking tips collected from various books, the internet, recipes, and experience. I will add to them often. I wanted to show them on here for my e-mail followers and fellow bloggers. So check back often. 1. If you are going to freeze a loaf of bread, make sure you include a piece of paper towel in the package to absorb moisture. This will keep the bread from becoming mushy when it is thawed out! 2. Store brown sugar in the freezer and it won’t clump up. Best to place it in a plastic baggie and removie it from the box. 3. The best location to store spices is in a cool, dry spot where they will not be around heat. Storing spices near a microwave exhaust fan or over the range are two of the worst locations. 4. When baking biscuits it is important to cut out as many biscuits as possible from the first rolling of the dough. The more you roll out the dough, the tougher, the biscuit will be. 5. Blueberries are the top source of antioxidants in the produce department. You should always check the bottom of berry containers to be sure they are not stained from rotting or moldy berries. 6. Milk should be purchased as your last purchase in the supermarket. The longer it is away from refrigeration, the shorter its lifespan and freshness. 7. When you buy a container of cake frosting from the store, whip it with your mixer for a few minutes. You can double it in size. You get to frost more cake/cupcakes with the same amount. You also eat less sugar and calories per serving. 8. Don’t store apples and carrots in the same fridge compartment. The apples emit a gas that makes the carrots bitter. 9. Self rising flour is made by adding 1 1/2 tsp. of baking powder and 1/2 tsp. salt to 1 cup all-purpose flour. If you want to substitute self-rising flour for regular flour in a recipe, just omit the baking powder and salt from the recipe, and use self-rising. 10. For a crisp skin on a baked potato, prick the skin 3 or 4 times and place a few drops of oil on the potato, then rub it in. Next, sprinkle the potato with salt before baking. 11. Microwave garlic cloves for 15 seconds and the skins slip right off! 12. Always buy peppers and onions when they’re cheap…chop them up and freeze them. Use as needed. 13. For the crispiest french fries sprinkle them with all-purpose flour before frying. 14. When using dried beans and peas, keep in mind that 1 cup of dried beans or peas makes 2 1/2 cups cooked. 15. Mushrooms should be wiped off with a damp cloth and not washed under the faucet since they are like sponges and will absorb the water. 16. If your soups and sauces are too thin or watery, try adding a few instant potato flakes as a thickener. 17. If honey or molasses crystalizes, place jar, without lid, in a pot of hot water about 1/2 hour and crystals will be gone. Can also put jar in microwave about a minute or two. 18. In your fruit and vegetable drawers put tin foil in the bottom with the shiny side up. Keeps fruit and vegetables fresher for longer and drawers clean, too! 19. If a pie bubbles over in the oven, put a handful of salt on top of the spilled juice. The mess won’t smell and will bake into a dry, light crust which will wipe off easily when the oven has cooled. 20. Romaine lettuce is loaded with vitamins. Compared to iceberg, it has 3 times as much Vitamin C and six times as much Vitamin A. 21. Save bacon drippings and use to season vegetables, eggs, soups and sauces. They add meat flavor. 22. Butter pie pastry scraps, sprinkle with cinnamon and sugar and bake like cookies. Children love them! 23. Rescue stale or soggy chips and crackers. Preheat the oven to 300 degrees. Spread chips or crackers in a single layer on baking sheet and bake for about 15 minutes. Allow to cool, seal in plastic bags or containers. 24. If your recipe says preheat your oven to 400 degrees, you should preheat to 425 degrees and decrease to 400 when you put your dish in. You lose heat when you open the oven door. 25. 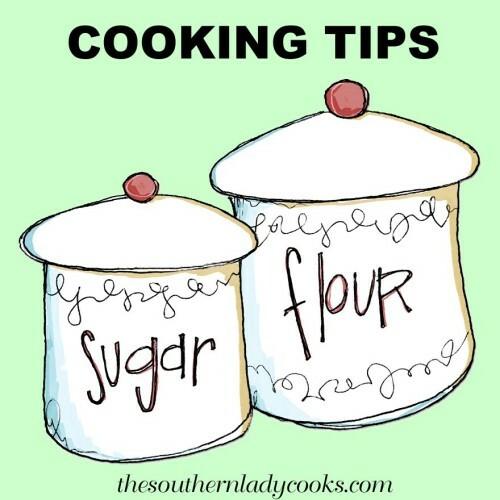 When a recipe calls for you to sift the flour and dry ingredients together, it is much easier and quicker to put the dry ingredients in a bowl and stir or beat together with a whisk. 26. If you want to test baking powder for freshness, add a teaspoon to a glass of water. If it does not fizz the baking powder is too old and should be tossed. 27. For measuring sticky ingredients like peanut butter, honey, syrup, etc. coat or spray the measuring cup with vegetable oil for easy pouring and ingredients will not stick to the cup. 28. Use canola oil for frying. It is low in saturated fat, has high burning point, and does not detract from the flavor of the food you are frying. 29. Use a small electric coffee grinder, found at Walmart for less than $20, to grind seeds, whole spices, and nuts for recipes. 30. Unless the recipe calls for a specific size, assume that all eggs used in recipes are Grade A large. Using medium or extra-large eggs could throw a recipe off. 31. Grate any cheese you plan to add to a recipe. It will melt more quickly with no clumps. 32. Make sure cookie sheets are not too thin. The heavier your sheet, the less likely your cookies are to burn. If yours are thin and you can’t afford new ones, layer with aluminum foil. 33. Use a pizza cutter to easily slice through flats of fudge and candy squares. The process is fast and easy and you get nice, neat squares. 34. Cookies should look a little underdone when removed from the oven and should be light around the edges. They will continue cooking from the heat of the cookie sheet once removed. 35. Unsalted butter instead of margarine gives cookies a lighter texture. Using a cookie scoop or ice cream scoop to spoon out cookie dough gives cookies a uniform look and size. 36. To dress up cakes and pies, place a paper doily on top, then sprinkle with powdered sugar and remove. Quick and impressive! 37. Soften dried fruits in the microwave by placing fruit in a small bowl and sprinkling with water. Cover with plastic wrap and heat on high for 30 to 40 seconds. 38. Real vanilla flavoring is only necessary if what you are making is vanilla flavored such as vanilla ice cream. Otherwise, imitation is fine and less expensive! 39. To easily remove burnt-on food from skillets, add a drop or two of dish soap and enough water to cover bottom of pan and bring to boil on stovetop – skillet will be much easier to clean! 40. When making chocolate chip cookies always add the chocolate morsels last to the mix. It is best when they are very cold. I keep mine in the freezer. Just barely stir the morsels in — don’t over mix. 41. When cooking steaks or meat do not use a fork to turn the meat. Use cooking tongs or a spatula to keep the juices from leaking out. 42. To soften bananas for banana bread and muffins, pierce unpeeled bananas once or twice and microwave, uncovered, at 100 percent power for 1 minute, turning over at half time. Cool and peel. 43. If you accidentally put too much salt into your dish, you can re-balance the saltiness by adding chopped potatoes, tomatoes, or even a teaspoon of sugar. This will help bring the saltiness back down to a normal level. 44. Store the ice cream container in a big Ziploc plastic freezer bag. This will stop ice crystals from forming when it is in the freezer. 45. The best way to store fresh celery is to wrap it in aluminum foil and put it in the refrigerator–it will keep for weeks. 46. Before storing tomato-based sauces or other foods that can stain, spray your plastic storage container with nonstick cooking spray. 47. Slice open the top of a marshmallow bag then place in a large ziploc freezer bag. Freeze. Remove the amount of frozen marshmallows you need as you need them. Thaw and they’re soft and ready to use. If you have hard marshmallows in the pantry, try tossing a piece or two of sliced bread in the bag. Seal, then check after a few days. The marshmallows should be soft again. 48. Cooking vegetables in boiling water removes most of the nutrients, so try cooking veggies quickly by steaming or stir-frying. 50. Buy large lemons and limes, they tend to be much sweeter. Make sure that the skin is thin, those are much juicer. To obtain more of the juice from lemons, limes or oranges, microwave on high for 30 seconds and then let stand for a couple of minutes before cutting and squeezing. Rolling them between your hand and the counter will also help release more juice. 51. Keep any left over nuts fresh by freezing them. No need to thaw for recipes or to eat. 52. To make a bought pie crust taste more “homemade” brush the bottom with milk and sugar before baking. 53. To make a bigger cake from a mix, add 1/2 cup flour, 1/2 cup sugar, 1 egg, 1 tsp. baking powder. convenient place for your spice rack may be above your stove, moving your spices to a different location may keep them fresh longer. 55. When cooking dried beans, cook the beans with the lid on for soft beans and with the lid off for firm beans. If you salt beans while they are cooking they will take longer to soften. Salt beans after they have finished cooking. 56. Never wrap warm meat or poultry in aluminum foil and place in the refrigerator. Foil is an insulator and the meat will remain warm for too long allowing bacteria to thrive. 57. When cooking pasta use a large pot to keep water at a rolling boil. Pasta placed in water that is not boiling will not “set” properly and may stick together. 58. Do not use low-fat or whipped butter or margarine for baking. Both have too much water and air content and may cause cakes or cookies to collapse or flatten out. 59. Never refrigerate potatoes, tomatoes, onions, garlic or parmesan cheese(the kind in the green can). They lose quality, texture and taste. 60. Pepper is one of the most popular spices but ground pepper loses its flavor quickly. It is best to use a pepper grinder so your pepper will be fresh and flavorful. 61. Always lock the tabs on each end of the Reynolds wrap, Saran wrap and plastic wrap. They hold the roll in place and save you time rewinding unwound rolls of paper. 62. The russet potato is best for baking, mashing, and french fries. The red or white potatoes are best for boiling, make great potato salad, stews, soups, and scalloped potatoes. 63. Steam vegetables instead of boiling. Boiled vegetables lose 42% of nutrients compared to 2% when steamed. 64. A well-marbled piece of beef, pork or lamb will baste itself during the cooking process and the meat will stay moist, juicy and tender. Ultra-lean cuts of meat can dry out if they’re not basted, so think of a well-marbled piece as self-basting. 65. Freeze leftover vegetables from a meal to use in vegetable soup. No need to put in separate containers for freezing. Saves you money and time! 66. A couple of ways to re-freshen and heat biscuits: put them in a well-dampened paper bag, twist it closed and put in a 300º oven for several minutes or until warm or can put in Reynolds wrap and sprinkle the biscuits with water and heat for several minutes. 67. Always add the chocolate chips last to the cake mix. It’s best when they are very cold. Just barely stir the morsels in –don’t over mix. I keep mine in the freezer. 68. When browning ground meat, brown several pounds and drain. Divide evenly and freeze in containers. Unthaw in microwave for quick fixing next time. 69. 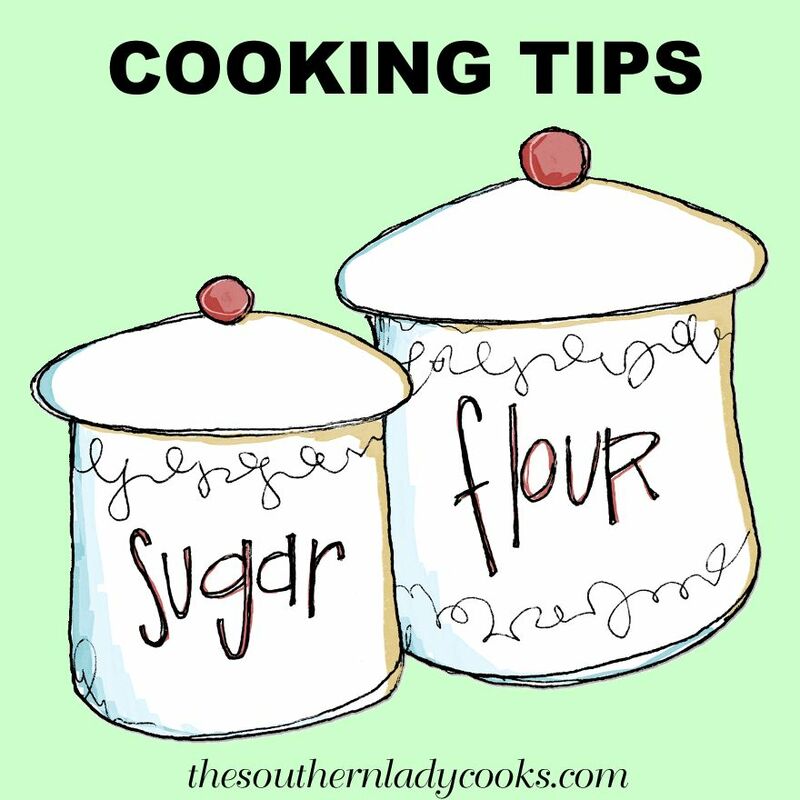 Southern cooks always add a pinch of sugar to the water when cooking vegetables. It brings out the flavor. 70. When separating eggs, break them into a funnel. The whites will go through leaving the yolk intact in the funnel. 71. Use milk to thaw frozen fish. It takes away the fishy taste and tenderizes the meat. 72. If you have over-ripe bananas place them in bags in the freezer. The skins will get dark but the banana will be perfect to use. 72. If you need to use only 1/2 an onion in a recipe, save the root half. It will keep longer. 73. Always turn meat and chicken pieces with tongs instead of a meat fork. Piercing with a fork allows juices to escape and causes meat to be dry. 75. Leaving the skin on the chicken, when cooking it, helps to hold in juices, which increases tenderness. Removing the skin before eating chicken eliminates about two thirds of the fat content. 76. Crush garlic with the flat side of a chef’s knife. Skin slips right off. 78. To freeze muffins wrap well in foil and place in resealable plastic bags. 79. To preserve your wooden cutting board, occasionally rub it down with a couple of drops of edible cooking oil. This will also help prevent food from sticking to the board. 80. To soften dried fruits in the microwave, place fruit in a small bowl and sprinkle with water. Cover with plastic wrap and heat at HIGH for 30 to 40 seconds. 81. You have 2 hours from the time you remove food from the oven until it needs to be refrigerated for safety. 82. Always remove baked goods as soon as a toothpick inserted in the middle comes out clean. Baked good will be dry if over cooked. If a recipe says 25 to 30 minutes, I always check at 20 to 25 since different ovens vary. 83. Put small piles of cornmeal where you see ants. They eat it, take it “home”, can’t digest it so it kills them. It may take a few days but you don’t have to worry about pets or small children being harmed. 84. Today’s tip – Take your bananas apart when you get home from the store. If you leave them connected at the stem, they ripen faster. 86. Fruit juices such as pineapple, orange or mango can be used as salad dressing by adding a little vegetable oil, a dash of nutmeg and honey if desired. Great on fruit, seafood or mixed greens. 87. The most convenient warm place in which a batter OR dough can rise is the inside of a switched-off oven with the light on. 88. Cooked rice freezes quite well for as long as 3 months. In the refrigerator, it stays fresh for a week. 89. How to tell a hard-cooked egg from a raw one? A hard-cooked egg spins beautifully; a raw one wobbles as it spins. 90. To keep egg yolks from crumbling when slicing hard-cooked eggs, dip the knife into water before each cut. 91. Egg whites whip best at room temperature, but cream whips best when cold. 92. To freshen shredded coconut, soak in milk with a dash of sugar a few minutes before using or place in a sieve, set over boiling water, and steam until moist. 93. To any yellow or white cake mix, add 1 teaspoon each of vanilla extract and lemon extract for a much-improved flavor. 95. Save the juices from canned fruits. Combine several kinds and add orange juice and/or ginger ale to make a great punch drink for children. Freeze it in ice trays for popsicle treats, too. 96. Children are fascinated with food served in unusual shapes. Cut bread with a rabbit or other shaped cookie cutter for a fun sandwich. Keep a supply in the freezer ready to use at any time. 97. When adding flour to a hot liquid for thickening purposes, first blend the flour with several tablespoons of cold water and mix to a thin paste. There will be no lumps. 98. Cook tougher cuts of meat in strong tea instead of water. The tannin in tea is a tenderizer. 99. Buy 1 pound of any inexpensive margarine and soften it in a bowl. With a hand mixer, whip the margarine until it changes color. Add 1 cup buttermilk and continue to whip. This will make 1 1/2 pounds of really fluffy, fresh, and tasty whipped margarine. 100. If you are out of baking powder, mix 1/2 baking soda and 1/2 cream of tartar. 101. Store coffee in the refrigerator or freezer to keep it fresh longer. 102. Dried herbs and spices lose their potency quickly. Buy only a small amount at a time. When using fresh herbs and spices, use 3 times the amount of the dried. 104. -Bay leaves in your pantry will keep pests away. A bay leaf in a container of flour, cornmeal, or cereal will keep weevils out..
105. According to the Egg Safety Center, eggs should always be refrigerated in their cartons, raw eggs stay fresh 4-5 weeks after purchase if continuously refrigerated, hard cooked eggs are safe up to a week in the fridge, and blood spots on an egg do not mean it is contaminated. Blood spots are just an error made by the hen. (LOL). 107. -Often, during the summer food is prepared and left to sit out while guests munch over the course of hours. Bacteria grow rapidly between 40 °F and 140 °F, perishable food should never sit out more than 2 hours. If the temperature is over 90 °F,food shouldn’t sit out more than one hour. Refrigerate or freeze leftovers promptly and discard any food that has been out too long.-USDA. 108. Add a couple tablespoons of baking soda to cold water when washing fresh veggies. This removes pesticides, dirt and wax. 109.When boiling corn on the cob, add a little sugar to the water to bring out the flavor. Do not add salt, it toughens the corn. 110.After eggs are refrigerated, it is important that they stay that way. A cold egg left out at room temperature can sweat, facilitating the growth of bacteria. Refrigerated eggs should not be left out more than 2 hours. 113..When picking a melon, smell it for freshness and ripeness. The spot on the end where it was plucked from the vine should be soft. 114. Rub potatoes skins with oil or butter before baking to keep the skins from becoming tough. 115. When grilling use a food thermometer. Pork, lamb, veal, & whole cuts of beef should be cooked to 145°F measured by a thermometer placed in the thickest part of the meat, followed by a 3-minute rest time before carving or eating. Ground beef should reach 160°F, poultry should reach a minimum temperature of 165°F, fish cooked to 145°F. Cooked meats & hot dogs should be grilled to 165°F till steaming hot. 117.Marinating meat in vinegar or a vinegar based sauce helps to tenderize and kill bacteria in the meat. It is better to marinade in a plastic bag and not anything metal. Never reuse a marinade.. .
119. Strawberries are best when eaten within 2 to 3 days of purchasing. They are high in antioxidants, vitamin C and fiber. They will keep in the freezer up to a year. 120. If you don’t want to boil, steam or grill your fresh corn, try cooking it in the microwave right in the husk. Microwave for 2 minutes per ear, husks and silks slip right off with no mess and no loss of flavor. 121. Blueberries are high in antioxidants, vitamin C and K. Will keep in the fridge 8 to 10 days. Do not wash until ready to eat. Freeze in single layers on cookie sheets, place in freezer airtight bags after 24 hours. 122. Potatoes will keep at room temperature for up to two weeks or longer when stored in cool temperatures. Remove them from plastic bags and place in a basket or a container so that they will have proper air circulation. A paper sack would be better than plastic because it will trap moisture. Don’t store in the frig. & do not store with onions, the gas given off by onions accelerate the decay of potatoes. 123.For taller, lighter and flakier biscuits cut straight down with cutter. Twisting makes biscuits uneven. For crusty edges arrange biscuits 1″ apart, for softer edges put them close together.Place on sheet upside down from the way you cut them. Knead as little as possible and get as many as possible from 1st cutting. 123. To soften butter quickly, cut into chunks and allow to soften at room temperature about 15 minutes. If time is limited, place an unwrapped stick of cold butter between sheets of waxed paper and hit it with a rolling pin on each side to smash butter. To soften butter in the microwave, select the defrost setting (30% power). Check sticks of butter every 5 seconds so that they do not over-soften or melt. 124. When choosing zucchini smaller is better. Don’t go over about 8 inches in length. Zucchini keeps in the refrigerator for about 5 to 6 days. It is high in potassium and low in calories. Use in salads, soups, breads, muffins, casseroles, roasted, grilled and steamed. Freezes well for use in recipes during the winter months. 125. When buying cucumbers look for firm, green, not mushy and not wrinkled cucumbers. Store on top shelf of refrigerator or in low humidity drawer. Do not store in plastic bags because the bag holds in moisture and they need air circulation. Cucumbers will start to turn soft in 2 days if not refrigerated and will keep up to 10 days in the refrigerator.The flesh of cucumbers is a very good source of vitamins A, C, and folic acid. 126. One teaspoon of honey has 22 calories while one teaspoon of sugar has 16 calories but honey has a higher sweetening power than sugar so you don’t have to use as much. If honey crystallizes, place in microwave 2 to 3 minutes in an open container. Always store at room temperature. Honey does not contain any chemicals and has small amounts of vitamins and minerals. Is great for digestion. 127. Replacing ordinary sugar with sorghum, increase the amount of sorghum by 1/3 over the amount of sugar called for in the recipe and decrease the amount of liquid (milk and/or water) by this same amount. This is to keep the amount of total liquids and sugars in balance. 128. Dried herbs should be green and smell strong. If you crush them between your fingers and they don’t smell strong they are old and should be discarded. Dried herbs will keep between one and three years. 129. Raisins will keep in the refrigerator in an airtight container for up to a year. Cabinets are usually too warm for raisins. Plump raisins by soaking in warm water for about 15 minutes, then drain before using in a recipe. In baking, toss raisins in flour to keep them from sinking to the bottom of the pan during the cooking process. 130. To freeze green tomatoes from the garden for frying during winter months, wash, core, and slice tomatoes 1/4 to 1/2 inch thick. Pack into containers separating slices with wax paper. Tomatoes keep 10 to 12 months. Do not thaw before cooking.